This was written back in mid-2016, shortly after the Liberals were re-elected federally. By that time it had also become clear the Democrats had squandered their path to victory via Bernie Sanders, dismissed large elements of the public as deplorables, and were at risk of leading Americans into the arms of a white supremacist President. Last night, NSW voters delivered another terrible election result, not only for the return of the Liberal Government for a third term, but also for the eight years given to Mark Latham to promote hate speech under parliamentary privilege. Given the rise of white supremacy and the existential crisis presented by climate change, we actually don’t have time to become mired in frustration with the masses. Instead, progressives need to channel justified anti-establishment anger away from scapegoated minorities and towards the system itself. We need to tell a better story and outwit right-wing populists. Surely it can’t be that hard. The term ‘populism’ has become an insult, but it’s not something left-wing parties should sneer at. The cause of One Nation’s regeneration, populist politics, is also likely to be the solution. In a surprising deviation from their impoverished coverage of Election 2016, the mainstream media are accurately reporting one thing: populism is on the march in Australia. Sunday’s Sydney Morning Herald editorial headline was “Instability Grips Nation Amid Surge In Populism”. Bloomberg reported “Populist Rebuff Sparks Turmoil Amidst Deadlocked Aussie Vote”. The Australian Financial Review went with “Political Failure To Reject Populism Recipe For A Genuine Crisis”. The Liberal vote has sunk and support for Labor and the Greens has stalled. Populist figures like Pauline Hanson, Nick Xenophon, Jacqui Lambie and Derryn Hinch are the main beneficiaries of the drift away from the major parties. As a result, the populist label is being bandied about willy-nilly, often without much explanation or context. So what is populism? What are the differences between right-wing and left-wing populism? And where are Australia’s left-wing populists? Populism is a notoriously slippery concept with a long history. The phenomenon dates back to the radical movements of the Diggers and the Levellers which emerged in the 17th century during the English Civil War. Political scientists have been debating the term for about fifty years. A 1967 conference on populism at the London School of Economics included a lecture by US historian Richard Hofstadter called “Everyone is Talking About Populism, But No One Can Define It”. At the same conference, economist Peter Wiles said populism had 24 defining characteristics, but even then admitted to many exceptions without any of these features. Nonetheless, drawing on a range of literature on the subject, most forms of populism have two features in common. First, populism sets up an opposition between ordinary people and the establishment or related “other”. In the case of left-wing populism, the people are bound together in opposition to the ruling class – the political, financial and media elites governing our societies. Occupy Wall Street offers a clear example of left-wing populism. The people were united under the slogan “We are the 99%” and their enemy was labelled as the 1%. Right-wing populists similarly rail against the establishment but usually also blame an associated “other”. The “people” are constructed to the exclusion of both elites and a particular minority. Typical examples are Pauline Hanson and Asians/Muslims, Donald Trump and Muslims/Mexicans, Nigel Farage and immigrants/refugees. According to Benjamin Moffit, author of The Global Rise of Populism, right-wing populists blame elites for being too soft on their targeted minority of choice. You see it in the spate of opinion pieces equating Donald Trump with Bernie Sanders and then dismissing both. You see it in anti-Corbyn rants in the UK and anti-Hanson rants in Australia. Left or right, populism offers a powerful challenge to the neoliberal consensus. As such, it earns the ire of elites globally. Yet people are justifiably angry. The neoliberal system has failed millions across the world and Australia is not exempt. With inequality soaring and trust in government collapsing, populists offer an alternative. By engaging with marginalised voices, exposing dysfunctions of the current system, and often using a charismatic and entertaining style, it’s no surprise populist candidates attracted so many Australian voters this election. The challenge for progressives is channelling this justified anti-establishment anger away from scapegoated minorities and towards the system itself. British Labour leader Jeremy Corbyn. With this goal in mind, it’s worth discussing the worldwide spread of left-wing populism. The intellectual and political roots of the recent spike in left populism are in South America. One of the most influential scholars of left populism was Argentine political theorist Ernesto Laclau. His academic interest was sparked by Argentina’s rich history of populism, especially that of President Juan Perón. Three years after the President’s death in 1974, Laclau published Politics and Ideology in Marxist Theory with a chapter called “Towards a Theory of Populism”. He returned to the subject in 2005 when he published On Populist Reason. Part of Laclau’s project was to reclaim the much maligned term for the left. He argued that populists are not always anti-democratic vulgar demagogues and reframed populism as an essential aspect of modern democracy: giving voice to groups marginalised by oligarchic forces. Laclau believed left populists should seek “the formation of an internal antagonistic frontier” – in other words, clearly define the establishment as the enemy. They should then use floating signifiers to bind diverse groups together in a broad coalition mobilised against the enemy. For example, the term “Occupy” linked together a series of isolated democratic demands from workers, students, immigrants and others in a set of unified popular demands. Obama’s use of the signifier “Change” in 2008 is a less radical example. By naming the ruling class enemy and using floating signifiers to bring together diverse demands in a broad coalition, Laclau saw left populism as the most effective path to radical democratic change. The effectiveness of left populism isn’t just theoretical. It took hold right across South America in the first few years of the 21st century. Left populists ranging from Hugo Chávez in Venezuela, to Evo Morales in Bolivia, to Rafael Correa in Ecuador, made enemies out of international finance and neoliberal capitalism. They constructed the “people” to include poor and marginalised groups and increased not just their political participation but also their material well-being. It’s no coincidence the intellectuals at the forefront of the electoral successes of Syriza in Greece and Podemos in Spain were heavily influenced by Laclau’s thoughts on left populism. Laclau was a Professor of Political Theory at the University of Essex for decades. Former Greek Finance Minister, Yanis Varoufakis, Syriza MP Fotini Vaki, and Syriza Governor of Athens, Rena Dourou, are all Essex alumni. Founders and leaders of Podemos, Pablo Iglesias and Íñigo Errejón, have both recognised how Laclau shaped their successful entry into Spanish politics. Errejón wrote his 2011 doctorate on Bolivarian populism and wrote an obituary for Laclau in April 2014 acknowledging the Argentine theorist’s influence upon him. A few weeks after Laclau’s death, Iglesias and Errejón created Podemos. Within five months of its creation it had achieved a million votes and five seats in European Parliament. It’s amazing what left populism can do for you. 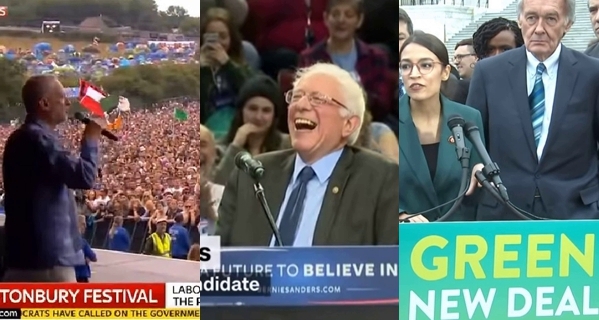 Over the last year we’ve seen progressive populism take off in the UK with Jeremy Corbyn and in the US with Bernie Sanders. Both the UK Labor leader and the Democratic candidate offer clear opposition to the establishment. Both aim to build a broad coalition to include marginalised voices. Both have rallied incredible popular support, much to the dismay of elites. Pauline Hanson in a recent video. On July 2, about 360,000 Australians, or 4.1 per cent of the electorate, placed One Nation first on the Senate ballot. They are on track to win between two and four seats. One Nation is a model case study in right-wing populism. The party combines an economic critique of the establishment with scapegoating of a related other, in this case Muslims. Their economic policies aim to “fix deep structural flaws in our country”, work towards “fairness and honesty in our tax system”, and seek to “restore manufacturing, jobs and exports”. One Nation also “opposes the privatisation of essential services” and has pledged to hold a royal commission into the banking and financial sector. Their social policies include zero net immigration, a royal commission into Islam and bans on the Burqa and building mosques. On the flipside of these election results, some commentators have suggested the static Greens vote should be further cause for introspection on the left. While One Nation recorded a 3.6 per cent swing in the Senate, the Greens vote is up just 0.1 per cent. Why are populists soaring and the Greens stagnating? The Greens have a strong policy platform and principled rhetoric on refugees and climate change. Yet until they take a hint from left populists in South America, Spain, Greece, the UK and US, and build an equally strong anti-establishment economic narrative, they will struggle to become the dominant progressive force Australia so desperately needs. While Greens supporters may justifiably protest that their policy platform has dozens of progressive economic reforms, their discursive style is largely restricted to cultural politics and borrows little from Ernesto Laclau. Many Australians feel our political system is failing them and they want someone to blame. They are looking around for politicians who listen to their concerns and prioritise their economic hardship. So long as the Greens and the rest of the Australian left fail to identify the establishment as the real enemy, right-wing populists will fill the void and grow ever stronger by blaming minorities for systemic ills. Instead, let’s make politicians like Pauline Hanson and Mark Latham redundant and give their followers a new home.